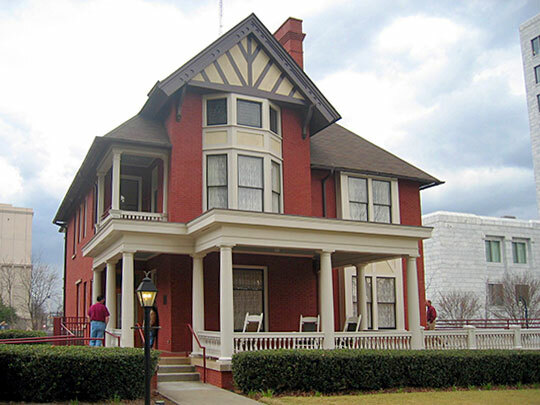 Photo: Margaret Mitchell House and Museum (Crescent Apartments), ca. 1899, 990 Peachtree Street, Atlanta, GA. Apartment 1 was the home of Margaret Mitchell and her husband from 1925-1932; much of the novel Gone with the Wind was written while living here. The Historic District was listed on the National Register of Historic Places in 2013. Photographed by User:Rolfmueller (own work), 2006, [cc-by-3.0 (creativecommons.org/licenses/by/3.0)], via Wikimedia Commons, accessed September, 2014. The Fulton County Courthouse is located at 141 Pryor Street, Atlanta GA 30301; phone: 404-730-8200. Fulton County was created from DeKalb County in 1853. While conflicting accounts of its name exist, most believe that the county was named for Robert Fulton who built a steamboat ca. 1807. During the Great Depression, ca. 1932, Milton and Campbell counties and the city of Roswell from Cobb county. Seventy miles of Fulton borders the Chatahoochee River. The Fulton County Seat was originally incorporated with the name Terminus, with subsequent name changes to Marthasville, and, finally, Atlanta. Atlanta was made the State Capital in 1868. Because of its odd shape, the result of annexations, Fulton is bordered by 10 other Georgia counties: Carroll, Cherokee, Clayton, Cobb, Coweta, DeKalb, Douglas, Fayette, Forsyth, and Gwinnett.